Today we follow up with part two of our guide on making beer at home. In part one, we described the basic equipment required to make beer at home, and an overview of the brewing process. Today we will walk through brew day and the start of fermentation. Again I would like to mention the “How to Brew Beer with Malt Extract” DVD/video that I shot with John Palmer – which covers every step in brewing with malt extract in a professional, visual way – take a look at the one minute trailer here. Brew day is my favorite part of the process. The smell of sweet wort bubbling away stirs something primeval in the human psyche. Since we are brewing an extract beer, there is not much preparation required. You need a clean pot large enough to hold 2-3 gallons of water plus the two cans (6 lbs of extract) and boil it (I recommend a 4-5 gallon pot if you can find one). Put 2-3 gallons of water into your pot and begin to heat it over your stove. Once the water has heated up a bit, open your cans of extract and slowly start mixing them into the warm water. The malt extract will have the consistency of heavy syrup, and you may need some hot water to get it all out of the sides of the can. The combined water and extract mixture is called “wort” (pronounced as ‘wert’ which rhymes with Bert). As you are adding the malt extract to your wort, you need to continuously mix it. If you do not mix it, the extract syrup will settle at the bottom of your pot where it will heat and caramelize, leaving a hardened caramel mess at the bottom of your pot. This carmelization can also alter the color and flavor of your beer, so it is important to mix well while heating. Once you have all of your extract mixed in, the next step is to bring your wort to a boil. This is best done slowly, as your wort will tend to bubble up a lot when it first starts to boil. The water you used for your brew has a lot of air in it, and these small air bubbles will be released as it comes to a boil creating foaming and a high potential for a boil-over. One method to reduce foaming is to use a spray bottle filled with clean water to spray down the foam. The best way to avoid a boil-over it to turn the heat down a bit as the wort just begins to boil, and then very carefully manage the heat during the first 15 minutes of the boil until you have a steady boil with minimal foaming. Also, do NOT use a cover on your pot! While a covered pot will come to a boil quicker, the first time you open the pot it will boil over immediately – making a huge mess on your stove. Once you achieve a steady boil it is time to add the hops. Weigh the proper amount and drop it in the hot wort. Some brewers use a mesh hops bag to reduce the mess later, but if you can cool your beer quickly most of the hops will drop out after the boil. Stir occasionally during the boil to reduce the chance of extract settling to the bottom and carmelizing. I recommend you boil for 30-60 minutes. Boil time and size will affect your hop utilization and beer bitterness, so it is a good idea to use a tool like BeerSmith to balance your hops and boil time before you brew. When the boil has finished, you need to cool the hot wort to room temperature as quickly as possible to reduce the chance of infection. 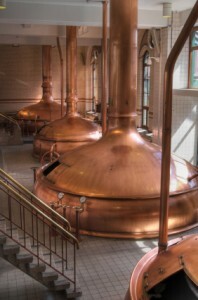 Many beginning brewers immerse their pot in a cold ice bath. Adding very cold water to the wort to bring it up to your target batch size (usually 5 gallons) will also help. More advanced brewers will use a chiller such as an immersion coil that runs cold water through a coil of copper tubing to quickly cool the beer. If needed, add sterile water to the wort when you transfer it to your fermenter to achieve the target volume of 5 gallons. The wort at this stage is very vulnerable to infection so you need to make sure that your fermenter, airlock, siphon tubes and anything else that touches the wort or yeast are thouroughly sanitized. I use a solution of 5 gallons of water and small amount of household bleach to sanitize my equipment. However if you use bleach you must carefully rinse everything with hot water or you risk leaving your beer with a chlorine taste. Your wort must be fully cooled to room temperature (72 F or less) and siphoned or dumped into your fermenter before you add (pitch) your yeast. Don’t worry about all of the junk (hops and proteins – called the “trub” in brewers lingo) in the wort – most of it will fall to the bottom during fermentation. Pitching yeast in hot wort will kill it, so wait until your wort has fully cooled before adding yeast. I highly recommend the use of liquid yeast as it is superior in quality to dry yeast. Liquid yeast comes in either a plastic tube or smack pack. The plastic tube type can be added directly to the wort. The foil smack-packs require you to pop an internal pouch containing the yeast several hours before pitching it to allow the yeast to grow in a self contained starter. Follow the instructions on your yeast pack to prepare it and then carefully add it to your fermenter. Once the yeast has been added and mixed in, close the top, fit your airlock (which needs a little water in it) and set your beer in a dark cool place where the temperature is steady. Your airlock should begin bubbling within 12-36 hours, and continue fermenting for about a week. If you see no bubbles from the airlock, check the fit on your plastic pail and airlock. Often plastic fermenters have a poor seal on the lid that leaks. The bubbles in the airlock are CO2 produced by the fermentation, and will slowly tail off as fermentation nears completion. Assuming you have a good seal, the bubbles should slow to one every minute or two before you consider bottling. As a minimum I would ferment for a 1-1/2 to two weeks before bottling. At this point you’ve brewed your first beer, and the yeast will ferment your wort for the next week or two before you will need to concern yourself about bottling the beer. Next week we will cover the bottling and aging process in Part 3 of our series on How to Brew Beer. Thanks again for joining us on the BeerSmith Home Brewing Blog. If you missed part one of this article, you can find it here. Be sure to subscribe by email or RSS for regular delivery, and check out the podcast, also available on the main blog page. Hi. One thing I don’t understand about the “How to Brew Beer – 5 Steps . . . Part 2” is what about the barley grains? Aren’t they part of the process? Or does the malt extract take the place of? If so, then how come some kits have both grains and malt extract?? When brewing an extract recipe with grains, you basically “steep” the grains in the water for 15 minutes before you add the extract and boil it. These “steeped grains” add body, color and flavor to an extract brew. Really well written post. I will quibble about the liquid yeast recommendation. I think dry yeast has gotten a bum rap because so many cheap kits included old or even bread yeast. I use Safale 04 and 05 and have found them just fine. For newbies starting out, I think the ease of use, quality, and price will trump the small advantages that the liquids have. Making starter batches can wait for another day. Again, it’s a clear and well written post. Thank you for that. I really like what you’ve done here! I want a blog of my own… who you hosted with mate? Question about trub . I’ve been led to believe that it’s important to leave this in the brew pot , so I do a whirlpool and siphon the cooled wort into my carboy for fermentation. Two questions: 1. How important is it to separate the wort from the trub? In my experience, not separating makes for unappetizingly cloudy beer. 2. When I siphon the wort from the trub, I leave behind about 2 quarts of concentrated wort in the brew pot with the trub. Should I then not add enough water to the fermenter to make 5 gallons for fear of over dilution or just not worry about it? What are the proportions of ingredients do you need for a 5 gallon batch? I have not brew before and I want to try brewing. I live in an apartment. I have two questions. The first one is this dark cold room you mentioned in part 2 of the brewing. You said, Once the yeast has been added and mixed in, close the top, fit your airlock (which needs a little water in it) and set your beer in a dark cool place where the temperature is steady. I don’t have a cold dark room. Can I used the pantry in my kitchen? My next question is about the aging process of the beer which is about 6 weeks. Are there catalysts or something that can reduce this aging process, let say a to week to two? You can ferment in a pantry – it should work fine as long as you keep the temps relatively cool. You can also wrap wet towels around the fermenter to lower the temperature even a bit more. Just keep it out of the light as light in general is not great for beer. You don’t always need to age for 6 weeks, however beer generally gets better with age especially in the first few months. You can use some clarifiers to aid in clearing the beer faster. Just do a search for clarity here and you will find several articles on it. Thanks a lot for your answer and the suggestions. This question came to me after I read your monthly news letter. Most international friends and people prefer Heiniken Beer to American Beers. For example, whenever I go to some parties, there will be a mixture of beers in different coolers, but I have observed that Heiniken Beer is the first Beer to finish from the coolers. Do you think it has to do with First Wort Hopping? I personally prefer Heiniken Beer compare to others. I don’t know if Heiniken uses FWH or not – but they do a great job marketing and have a pretty good lager which is why many people reach for it over some American beers. I am a newbie, to this but very intrigued by all of it.My question is can all of the ingredients needed usually available in public grocery stores?And if not how about where to aquire supplies to farm or grow my own ingredients?? Hi I’m abongile from. Durban south africa . How to brew your first batch of beer!